A perfectly-thrown fade into a big receiver’s hands for a touchdown is one of the more beautiful things in football. However, so is literally everything Saquon Barkley has done on the field for the first six games of his NFL career. As even the biggest fans of the 1-5 New York FOOTBALL Giants would attest, beauty does not necessarily equal value. The simple fact is, things that are impressive don’t always map to things that have worth in terms of winning football games. The end-zone fade is one of these things. Fade the fade. Since 2013, just under 33% of fades into the end zone from the five-yard line and in have been completed. Despite being the most-targeted route in this situation during that time frame, this represents the lowest completion percentage among routes with more than five targets, and on average, those routes result in a loss of 0.08 expected points each time they are targeted. That’s right, throwing the ball into the end zone to (generally) a one-on-one matchup, in a game that substantially favors the offense, gets you further away from scoring, on average. This is not unique to the NFL, either. In our college dataset (2014-present) roughly the same thing holds true – the fade is the most-often thrown route into the end zone inside the five, and it’s successful the least (under 35% in the amateur game). Other routes in this situation, quick outs (75% completion), stick routes (60%), crossing routes (59%) and slants (54%), for example, are not only completed at a higher rate, but they also generate positive expected points added on average. Even routes like corner routes and a normal out routes, while completed at less than a 50% rate, still generate a positive EPA on average – demonstrating the substantial value inherent in and propensity towards scoring touchdowns from inside the five-yard line in the NFL. There’s a natural question to ask here, which is “does the route matter as much as the player you’re targeting it with?” We’re more than open to the idea that throwing fades to weaker players (ones that often get single coverage) would be losing propositions more often than not. 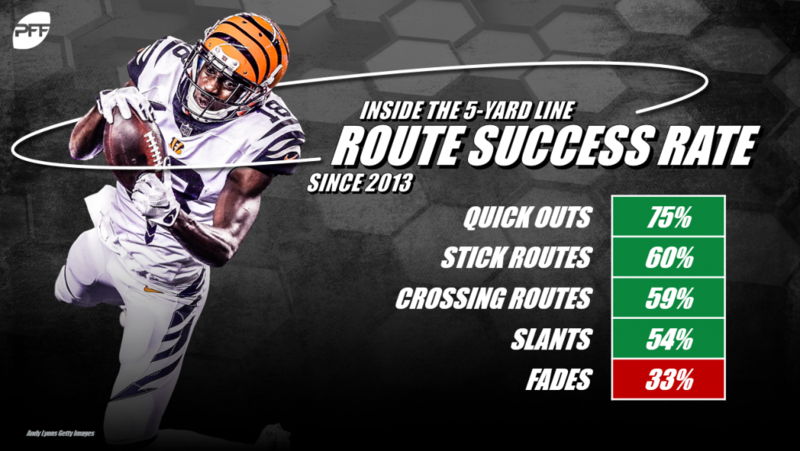 Interestingly, however, the answer to the above question is “pretty much”, as the following players are the only ones who have seen 10 or more targets on fade routes since 2013: DeAndre Hopkins, Dez Bryant, Brandon Marshall, Jimmy Graham, A.J. Green, Calvin Johnson, Alshon Jeffery, Michael Crabtree, Julio Jones, Larry Fitzgerald, and Rob Gronkowski. These are all above-average players, conservatively. The only player that caught more than 50% of the fades thrown his way was Calvin Johnson, and the average completion percentage on passes to these players in this situation is also just under 33%. How bad is the state of the great goal-line route? It’s worse than running the ball. Now, we’ve been staunchly against the running game for quite some time, and we’re not alone. However, as empirically-driven people, there’s no denying this truth. For example, from the one-yard line, the goal line fade is completed just 38% of the time, while a run play is successful from the one over 54% of the time since 2013. Even if you look further away from the end zone, the conclusion remains. End zone fades are even worse than running the ball. It’s time to fade the fade.